According to Xinhuanet.com’s report on January 27 titled “Air force uses drones for the first time to conduct drills of joint supply”, for fast logistic services, in October 2017, Chinese air force signed an agreement on military and civilian strategic logistic cooperation with civilian logistic enterprises. To ensure such cooperation, the air force has conducted pilot study on ten areas of cooperation including emergency transport of troops, fuel and other supplies to remote areas. Recently it has organized joint military and civilian supply drills with three types of drones in Yunnan and Shaanxi participated by two civilian entities. The first drill project was the simulated emergency transport of maintenance supplies from strategic reserve to a radar station in Southern theater where the radar was assumed out of order. The supplies were packed into 6 packets and be airdropped by the drones of a civilian enterprise SF Express to the radar station within 50 meters of their destination. It took only 60 minutes. If road transport had been used, it would have taken 2.5 hours. The second drill project was the delivery of antitoxic serum from Xijing Hospital, Beijing to a certain radar station in Central Theater where a soldier was assumed to have been bitten by a viper. It took only 22 minutes for a small drone of SF Express to land smoothly at the basketball court in the radar station to be taken by a paramedic waiting there. Then the drone took off to return to its base on its own. As the radar station was located on hills with poor road, it took at least 2 hours to send the serum by road transport. Both projects were organized in Beijing by the logistic department of the air force. According to the officers in charge at the department, the air force has been carrying out all-round study of the projects for the establishment of regular logistic system of drones. 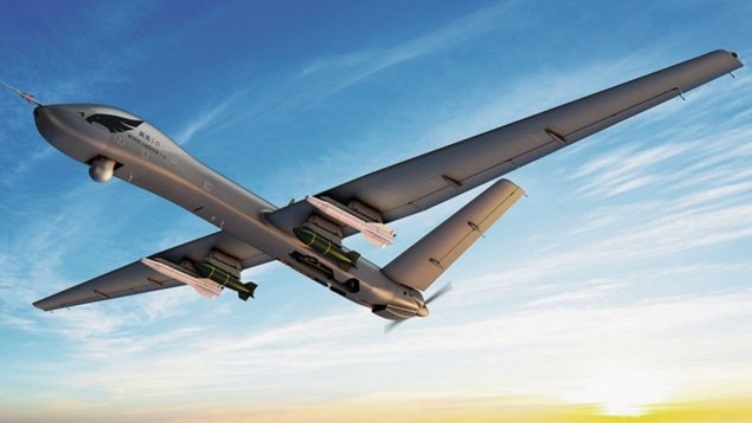 State-owned aerospace and defence prime Aviation Industry Corporation of China (AVIC) will expand its Wing Loong family of strike-capable reconnaissance medium-altitude long-endurance unmanned aerial vehicles (MALE UAVs) with the Wing Loong I-D platform, state news agencies reported on 25 January. Officials from AVIC’s Chengdu Aircraft Design and Research Institute (CADI) subsidiary were quoted as saying at the Wing Loong UAV Development Conference that the company is aiming to ready the Wing Loong I-D for its maiden flight and entry into the international market within 2018. The Wing Loong I-D is reportedly an improved version of the Wing Loong I UAV, which has entered service with the People’s Liberation Army Air Force (PLAAF) under the designation of Gongji-1 (Attack-1). A scale model of the new design was revealed for the first time at Airshow China 2016. According to specifications provided by AVIC during the event, the Wing Loong I-D is expected to be approximately 8.7 m in length, 3.2 m in height, and have a wingspan of 17.6 m.
The Wing Loong I-D will also be powered by a piston engine of unknown providence, with the company aiming to achieve a maximum speed of 280 km/h and a service ceiling of 7,500 m (24,600 ft). An operating endurance of 35 hours is also desired. Note: This is Jane’s 360’s report I post here for readers’ information. It does not mean that I agree or disagree with the report’ views. BEIJING (Reuters) – China must strengthen its nuclear deterrence and counter-strike capabilities to keep pace with the developing nuclear strategies of the United States and Russia, the official paper of the People’s Liberation Army (PLA) said on Tuesday. U.S. President Donald Trump’s administration may be pursuing the development of new nuclear weaponry and could explicitly leave open the possibility of nuclear retaliation for major non-nuclear attacks, according to a draft of a pending Nuclear Posture Review leaked by the Huffington Post. “In the roiling unpredictability of today’s world, to upgrade the capability of our country’s deterrence strategy, to support our great power position… we must strengthen the reliability and trustworthiness of our nuclear deterrence and nuclear counterstrike capabilities,” it said. A change was necessary despite China having developed nuclear weapons to avoid bullying from nuclear powers, the paper said, adding that China would always stick to the principle of “no first use” and a final goal of eliminating nuclear weapons. Neither Russia nor the United States is abandoning nuclear weapons as each adopts new high-tech weapons capabilities, the paper said, pointing to the U.S. Congressional Budget Office’s estimate of maintenance and modernization of the U.S. nuclear arsenal over the next 30 years costing more than $1.2 trillion. Trump’s strong embrace of his predecessor President Barack Obama’s nuclear modernization program has led some former senior U.S. government officials, legislators and arms control specialists to warn of risks from the U.S. stoking a new arms race. A U.S. national defense strategy released on Jan. 19 shifted priorities to put what Defense Secretary Jim Mattis called a “great power competition” with China and Russia at the heart of the country’s military strategy. BEIJING (Reuters) – The wife of detained Chinese rights lawyer Yu Wensheng said on Tuesday her husband had been charged with “inciting subversion of state power” and that police have summonsed her after she gave interviews to foreign media. Yu, who has been an outspoken critic of a Chinese government crackdown on his fellow rights lawyers and activists, was taken by authorities from outside his home in Beijing on Jan. 19 shortly after he was stripped of his legal license. Yu’s wife, Xu Yan, said police informed her on Saturday that her husband was being charged with “inciting subversion of state power” rather than the original lighter charge of “obstructing a public service”, she told Reuters on Tuesday. For the last two days, police in Xuzhou city in southeastern Jiangsu province have repeatedly called to ask her to come to the police station to speak with them in connection with her husband’s crimes, she said. The police told her that the reason she is wanted is because she had given interviews with the foreign media, she said. A man who answered the phone at the Xuzhou city public security bureau told Reuters he was unaware of the case. It is unclear why Yu is being held in Xuzhou. It is not uncommon for sensitive rights cases to be transferred to different jurisdictions. President Xi Jinping has presided over a sweeping wave of detentions and arrest of rights lawyers and activists, which has come to be known as the “709” incident after the date July 9, 2015, when the crackdown began in earnest. In response, the families and friends of the rights lawyers and activists have often taken up their loved one’s cause in the wake of their detention, sometimes becoming high-profile activists in their own right. An edited video of Yu’s detention showing him punching and swearing at the police officers was posed on YouTube on Jan. 22, and has since been shared repeatedly on Twitter. Xu Yan said the video was an attempt to smear her husband. The day before Yu was detained he had circulated a call for reform to China’s state constitution, which said China should delete a preamble that grants the ruling Communist Party primacy in leadership. What about the second generation of collective leadership which according to Deng, he was its core? From 1977 after Mao’s death to 1987 the Politburo Standing Committee (PSC) of CCP Central Committee was controlled by powerful elders Ye Jianying (who died in 1985), Deng Xiaoping, Chen Yun and Li Xinian, which to some extent can be regarded as leadership of three elders, an oligarchy instead of a collective leadership. When Deng, Chen and Li retired from the PSC in 1987, through Bo Yibo Deng told Chen and Li and got their consent that there should be only one mother-in-law for the new PSC that took office in late 1987, said Zhao Ziyang in his secret memoir. It made clear that Deng was the only one who had the power of leadership and all the other members of the so-called collective leadership had to accept Deng’s leadership faithfully, i.e. Deng was the core who had the final say. What about the new PSC? As Zhao Ziyang, the demoted CCP general secretary, pointed out in his secret memoir, all the PSC members were but “daughter-in-laws” who had to obey the instructions of Deng who regarded himself as PSC members’ “mother-in-law”. There was no collective leadership of the PSC after the three powerful elders Deng, Chen and Li had retired from the PSC. The general secretary and the PSC simply did what Deng told them to do. Deng was the real leader behind the scene. Before Tiananmen protests, Deng consulted other elders in making major decisions for the PSC. If there had been collective leadership, it must have been the collective leadership of powerful elders led by Deng. However, powerful elders differed in their opinions on the way to deal with Tiananmen protests so that Deng had to make the hard decision of armed suppression alone. Deng realized that there had to be a strongman as the core of CCP collective leadership able to make hard decision alone like him. That was why Deng appointed his successor Jiang Zemin as the core of the third generation of CCP collective leadership. He wanted there to be a strongman like him. As an experienced politician and general, Deng certainly knew that the core had to have the power as the core, which could not be transferred by him but had to be established by Jiang on his own. However, he had to set the example what power a core should have. He used Mao as an example but it was not good enough. Then he set his Southern Tour as an example to Jiang that a core had the power to tell all officials to act in accordance with his instructions no matter whether the core hold any official position or not. Deng said during his well-known Southern Tour that those who would not carry on his reform and opening-up should be fired. At that time there was serious backlash due to the Tiananmen Protests. Conservatives’ resistance to the reform had almost put an end to Deng’s reform. Jiang Zeming, though a true reformist, appeared like a conservative as Deng had given him the instruction that Jiang’s priority was to establish his powerbase. At that time nearly all China watchers outside China regarded Jiang as a conservative. Deng alone without official position recovered the reform by his power as the core of CCP leadership. Where was CCP’s collective leadership? There was no collective leadership at all. There was only the leadership of the core. Deng had no need to call a meeting of PSC to discuss and approve his instruction. He simply gave his instruction. What the PSC should do was to discuss the way to carry out Deng’s instruction. That was why I said in my book “Tiananmen’s Tremendous Achievements” that China’s political system was CCP Dynasty and the core of CCP Dynasty was in fact the emperor of the dynasty. It seems bad, but is in reality good. If the core does not remain in power there will be no continuity of his wise policy. In Deng’s case, China’s reform and opening-up would not have been carried on after Tiananmen Protests. A leader with wisdom and integrity is very rare, if a country has found one it shall keep him as the leader until the time he is unable or unwilling to bear the heavy burdens of leadership. It will be much better if such a leader is found and appointed when he is young. There will be much more time for him to play his wonderful role as a leader to bring prosperity to his country and happiness to his people. China’s well-known prime minister Zhuge Liang was appointed top advisor to Liu Bei (later emperor of the Empire of Shuhan) when he was only 27. He helped Liu set up the Empire and was its prime minister for more than two decades until he died at the age of 54. The problem now is that a man with wisdom and integrity is appointed leader when he is about sixty years old and can only serve 2 to 3 terms. Therefore, it is good that he will remain the core and continue his leadership after his retirement. That was the case with Deng Xiaoping. It is also the case with Jiang Zemin. Deng became the core in 1978 and retired from all official posts in 1990 but had to remain in charge after his retirement though he was succeeded by Jiang his chosen core of the third generation of CCP leadership. As Jiang had not established his powerbase as the core, when conservatives had almost put an end to Deng’s reform, Deng conducted his Southern Tour in 1992 to bring China back to the course of reform and opening-up. What power did Deng have to make the whole CCP and country obey his instruction to carry on his reform? His power as the core of CCP leadership. In 1990, Deng retired from his last official post as the chairman of Central Military Commissions but had not retired from his position as the core of CCP leadership. China is lucky Deng though became leader in 1978 when he had already been 74 quite old to bear the burdens of leadership, he lived a long life and could rule China for nearly two decades till he died at the age of 93. If Deng had become Chinese leader earlier and ruled China longer, Jiang would not have encountered so much difficulty in establishing his powerbase as the core of the third generation of CCP leadership. Deng told Jiang he would not rest at ease until Jiang had actually become the core. He helped Jiang obtain control of PLA (the People’s Liberation Army) by removal of Yang brothers’ control of PLA. Still by 1997 before the 15th Congress Jiang was challenged by PSC members Qiao Shi and Li Peng. As Deng was dead by that time, Jiang sought powerful elder Bo Yibo’s support to maintain his position as the core. Jiang was chosen as the core in 1989 but by 1997, he still had not fully established his position as the core. He had really gained the power as the core but we do not know the exact time when Jiang had really established enough powerbase as the core. If we assume that he really became the core by 1997, he only ruled China as the core for about 2 decades till now when he was succeeded by his chosen successor Xi Jinping. Hu Jintao has never gained the position as the core though he has set up his very strong CYL faction. As Jiang remained the core and remained in charge, the PSC with Hu as the head was not a collective leadership; therefore, there was no third generation of collective leadership either. This will be elaborated in my next post. WASHINGTON (Reuters) – The U.S. State Department said on Saturday that it was deeply concerned that a Swedish citizen and Hong Kong-based bookseller, Gui Minhai, had been detained in China and called for him to be allowed to leave the country. The Swedish government has said that Gui, who has published books on the personal lives of President Xi Jinping and other Communist Party leaders, was taken into custody last week while traveling with Swedish diplomats to seek medical treatment in Beijing. The European Union’s ambassador to China has called on the Chinese authorities to release Gui immediately, echoing demands from Stockholm. “We are deeply concerned that Swedish citizen Gui Minhai was detained,” State Department Spokeswoman Heather Nauert said in a statement. “We call on Chinese authorities to explain the reasons and legal basis for Mr. Gui’s arrest and detention, disclose his whereabouts, and allow him freedom of movement and the freedom to leave China,” she said. The United States and European allies would continue to promote “greater respect for human rights in China,” she said. Gui had been abducted in Thailand while on holiday in 2015, one of five Hong Kong booksellers who went missing that year and later appeared in custody on mainland China. The four others have returned to Hong Kong. Hong Kong, a former British colony, returned to Chinese rule in 1997 with a guarantee of wide-ranging freedoms, including freedom of speech, but critics accuse Communist Party rulers in Beijing of creeping interference in the city’s affairs. Chinese authorities said Gui was freed in October after serving a two-year sentence for a traffic-related crime in 2003. Gui’s daughter Angela told Radio Sweden he was taken off a train by plainclothes police while en route to the capital to get medical attention for a neurological ailment. Sweden’s Foreign Ministry has twice summoned China’s ambassador to Stockholm to explain the situation. 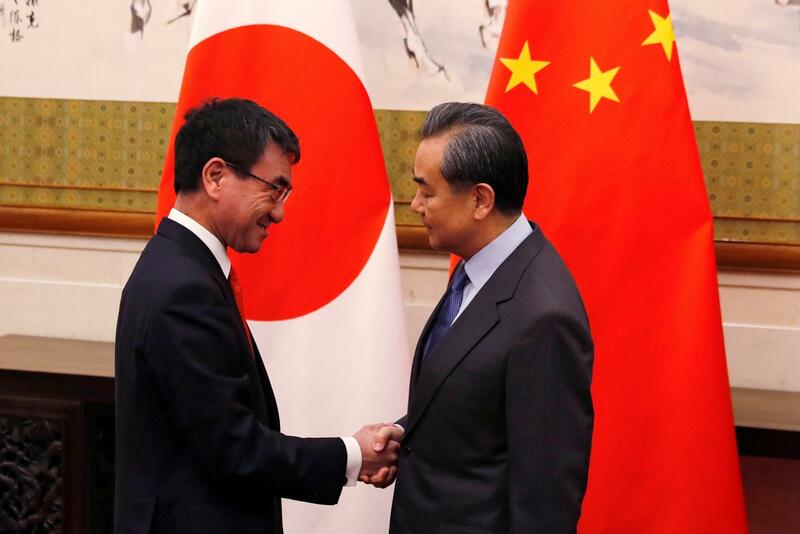 BEIJING (Reuters) – China hopes to work with Japan to establish more cordial relations, Chinese Foreign Minister Wang Yi told his Japanese counterpart on Sunday, aiming to move on from a series of disputes, some dating back to before World War Two.